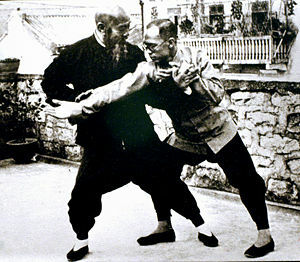 Wu Jianquan and student Pushing Hands, c. 1930. 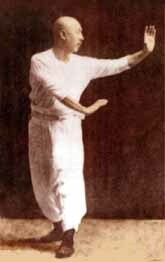 The term nèijiā usually refers to Wudangquan or the “internal” styles of Chinese martial arts, which Sun Lutang identified in the 1920s as T'ai Chi Ch'uan, Xíngyìquán, and Bāguàzhǎng. Most other martial arts are classified as "wàijiā" (literally, "external/outside sect"). Some other Chinese arts, such as Liuhebafa, Bak Mei Pai, Bok Foo Pai and Yiquan, are frequently classified (or classify themselves) as internal or having internal qualities (external/internal styles) and may be related to, or derived from, the primary arts. Nèijiā (internal) martial arts are traditionally associated with the Daoist temples on Wudang Mountains, while wàijiā (external) martial arts are linked with Buddhism and traditionally associated with the Shaolin Monastery, but these distinctions are somewhat ambiguous. Neijia styles teach awareness of the spirit, mind, chi (breath), and the use of relaxed leverage rather than unrefined muscular tension. Early training is done at a deliberately slow pace intended to improve coordination and balance and to require students to cultivate awareness of the whole body and its weight as they perform a technique. At an advanced level, and in actual fighting, internal styles are performed quickly. Nèi Jìn or Nèi Jìng (Chinese: 內勁 "internal power") is developed by using "nèigōng" (內功), or "internal exercises.” When nèi jìn is successfully exerted, body and breathing work together as a single unit, with no wasted effort anywhere in the musculature. Neijia uses “soft” techniques such as pushing, grappling, and open hand strikes to turn an aggressor's force and momentum to his or her disadvantage. The least possible amount of force is exerted to bring an adversary under control. Neijia styles emphasize flexibility and constant change in response to the actions of an adversary. This article contains Chinese text. Without proper rendering support, you may see question marks, boxes, or other symbols instead of Chinese characters. Nèijiā (internal) martial arts are linked with Daoism and are traditionally associated with the Daoist monastery on Wudang Mountains, while wàijiā (external) martial arts are linked with Buddhism and traditionally associated with the Shaolin Monastery. There is very little evidence, however, that any of the internal styles actually originated in the Wudang area, and additional criteria can be used to distinguish between these two families of martial arts. Internal or "soft" styles of Chinese martial art are sometimes referred to as Wudang styles regardless of whether they originated in or were developed in the temples of the Wudang Mountains, just as external or "hard" styles are sometimes called Shaolin regardless of whether the individual style traces its origins to the Shaolin tradition. All of these distinctions have some level of ambiguity and even the association with Buddhist or Taoist practices does not always clearly identify a martial art as wàijiā or nèijiā. Nèijiā incorporates yin-yang theory from the I Ching as well as the Five Elements of Taoist cosmology: water, earth, fire, wood, and metal. Animal imagery is evident in some of its practices. Motions of the body are combined and coordinated with neigong breathing to develop nei jin, internal power, for both offensive and defensive purposes. The term "nèijiā" and the distinction between internal and external martial arts first appeared in Epitaph for Wang Zhengnan, written by Huang Zongxi in 1669. Both Huang Zongxi and Wang Zhengnan were opponents of the Manchu Qing Dynasty, and his identification of the “internal” martial arts with the Taoism indigenous to China and the “external” martial arts with the foreign Buddhism of Shaolin (and the Manchu) may have been an act of political defiance rather than one of technical classification. In 1676, Huang Zongxi's son, Huang Baijia, who learned martial arts from Wang Zhengnan, compiled the earliest extant manual of internal martial arts, the Nèijiā quánfǎ. Another proposed etymology for the terms "nèijiā" and “wàijiā” is that some martial arts were taught exclusively to those inside (內; pinyin: nèi) one’s family (家; pinyin: jiā), while instruction in other martial arts, such as Changquan, was available to everyone, those outside (外; wÃ i) one’s family (家; jiā). 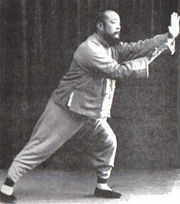 Sun Lu-t'ang standing in Xingyiquan's San Ti Shi stance. Sun Lu-t'ang (Sūn Lùtáng 孫祿堂, 1861-1932) was a renowned master of Chinese neijia (internal) martial arts and the progenitor of the syncretic art of Sun style Tai Chi Chuan (孫家). He was also considered an accomplished Neo-Confucian and Taoist scholar (especially in the I Ching), and was a distinguished contributor to the theory of internal martial arts through his many published works. Sun Lutang's eponymous style of T'ai Chi Ch'uan fuses principles from all three of the arts he named as neijia. Some other Chinese martial arts such as Wing Chun also teach “internal practices,” despite being generally classified as external. Some non-Chinese martial arts such as Aikido, I Liq Chuan, Ip Sun, and Kito Ryu jujutsu also also claim to be internal. Many martial artists, especially outside of China, disregard the distinction entirely. Some neijia schools refer to their arts as "soft style" martial arts. In 1928, when Generals Li Jing Lin, Zhang Zi Jiang, and Fung Zu Ziang organized a national martial arts tournament to select the best martial artists for the Central Martial Arts Academy, they separated the participants into Shaolin and Wudang. Wudang participants, recognized as having "internal" skills, were generally practitioners of T'ai Chi Ch'uan, Xíngyìquán, and Bāguàzhǎng. All other participants competed under the classification of Shaolin. A famous BaGua master, Fu Chen Sung, was one of 12 winners in the tournament. The label "internal," according to most schools, implies a focus on the internal aspects of a martial art during the early stages of training. Once these internal relationships are mastered, they can then be applied to the external practice of the martial art. External styles (外家, pinyin: wàijiā; literally "external family") are characterized by fast and explosive movements and a focus on physical strength and agility. External styles include both the traditional styles used for combat, as well as the modern styles adapted for competition and exercise. Examples of external styles are Shaolinquan, with its direct explosive attacks, and many of the Wushu forms that have spectacular aerial techniques. External styles begin training by developing muscular power, speed and application, and generally integrate their qigong aspects in advanced training, after the desired "hard" physical level has been reached. Some say that there is no differentiation between the so-called internal and external systems of the Chinese martial arts; others believe the internal martial arts promote greater stamina and endurance. Quote from the Taijiquan teacher Wu Jianquan (1870-1942). Nèi Jìn or Nèi Jìng (Chinese: 內勁) is the Chinese term for the "internal power." Theoretically the opposite of brute muscular force, nèi jìn is characterized by softness, elasticity, and flexibility. When nèi jìn is successfully exerted, body and breathing work together as a single unit, with no wasted effort anywhere in the musculature. Nèi jìn is developed by using "nèigōng" (內功), or "internal exercises.” A famous application of nèi jìn is the "fā jìn" (發勁) used by practitioners of the internal martial arts to generate relaxed but explosive force. A key aspect of fa jin is the recruitment of the body's sinews (tendons, ligaments, and other connective tissues) to release force rather than relying on muscular tension. Proponents of nèi jìn claim that as the body ages the power of muscles expanding and contracting gradually decreases, but coordinated nèi jìn and its resulting leverage increases if it is cultivated assiduously. Neigong, also spelled nei kung, neigung, or nae gong, are the breathing and meditation disciplines associated with Daoism. Neigong exercises involve cultivating physical stillness or conscious (deliberate) movement designed to produce relaxation or release of muscular tension, combined with special breathing techniques such as the "tortoise" or "reverse" breathing methods. The coordination of the body with the breath is regarded as the harmonization of the inner and outer (內外合一). The fundamental purpose of these exercises is to develop a high level of coordination, concentration and technical skill (neijin 內勁). The ultimate goal of this practice is to become one with heaven or the Dao (天人合一). Internal styles (內家) teach awareness of the spirit, mind, chi (breath) and the use of relaxed leverage rather than unrefined muscular tension. Pushing hands, (推手, Wade-Giles t'ui1 shou3, pinyin tuī shǒu), or sticky hands is a training method commonly used in neijia arts to develop sensitivity and softness. It consists of two-person training routines intended to undo a person's natural instinct to resist force with force, teaching the body to yield to force and redirect it. It develops leverage, reflex, sensitivity, timing, coordination, and positioning. Training with a partner allows a student to develop ting jing (listening power), the sensitivity to feel the direction and strength of a partner's force and thereby avoid or redirect it. Traditionalists criticize the contemporary "New Age" martial arts schools for emphasizing philosophy and speculation at the expense of hard work. Many people believe internal styles lack "external" physical training because in most internal schools, beginning students are expected to work on very basic principles for an extended period of time. This is not the case in the older schools, where much time may be spent on basic physical training, such as stance training (zhan zhuang), stretching and strengthening of muscles, and on empty hand and weapon forms which can be quite demanding. Also, many internal styles have basic two-person training, such as pushing hands and duet forms. Many forms in internal styles are performed slowly, although some include sudden outbursts of explosive movements (fa jin), such as those taught early in training in the Chen style of Taijiquan and later on by Yang and Wu style T'ai Chi Ch'uan. The deliberately slow pace is intended to improve coordination and balance by increasing the work load, and to require students to pay minute attention to the whole body and its weight as they perform a technique. At an advanced level, and in actual fighting, internal styles are performed quickly. The goal is to learn to involve the entire body in every motion, to stay relaxed, with deep, controlled breathing, and to coordinate the motions of the body and the breathing accurately according to the dictates of the forms, while maintaining perfect balance. Bāguà zhǎng literally means "eight trigram palm," referring to the trigrams of the I Ching (Yijing), one of the canons of Taoism. 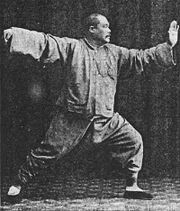 The creation of Baguazhang during the nineteenth century is attributed to Dong Haichuan, who synthesized several pre-existing martial arts taught and practiced in the region in which he lived, with Daoist circle walking. Baguazhang is characterized by its use of spiral movements and evasive footwork, relying almost entirely on open hand techniques (“palms”) and full body movement to accomplish its goals. Baguazhang contains a wide variety of techniques, including various strikes, low kicks, joint locking techniques, and throws. Baguazhang is based on the theory of continuously changing in response to the situation at hand. A proficient Baguazhang fighter dissolves around an attack, simultaneously redirecting the attack while closing the position, or utilizing the attacker’s offensive move against him. Basic solo training in Baguazhang teaches the student how to control his or her momentum and timing in order to generate power with the entire body mass as a coherent unit (zheng ti jing, “whole body power”), so that force can be issued from any part of the body with the support of all other parts. Whole body power is applied in all categories of Baguazhang techniques: striking, kicking, grappling and throwing. All styles of Baguazhang emphasize complete physical relaxation, correct skeletal alignment, natural movements which are in harmony with the body's inherent reflexes and design, and the direction of every movement by intent. Tai chi chuan (Traditional Chinese: 太極拳; Simplified Chinese: 太极拳; Hanyu Pinyin: tài jí quán; Wade-Giles: t'ai4 chi2 ch'üan2) uses “soft” techniques such as pushing, grappling, and open hand strikes to turn an aggressor's force and momentum to his or her disadvantage. The least possible amount of force is exerted to “capture” the center of balance and bring an adversary under control. Tai chi training primarily involves learning solo routines, known as forms (套路, taolu), slow sequences of movements which emphasize a straight spine, abdominal breathing and a natural range of motion; and different styles of pushing hands (tui shou, 推手) martial arts techniques. Accurate, repeated practice of the solo routine improves posture, strengthens muscles, encourages circulation throughout the body, maintains flexibility of the joints and further familiarizes students with the martial application sequences implied by the forms. A multitude of training forms, both traditional and modern exists. Some of tai chi chuan's training forms are known to Westerners as the slow motion routines that groups of people practice together every morning in parks around the world, particularly in China. While the image of tai chi chuan in popular culture is typified by exceedingly slow movement, many tai chi styles (including the three most popular, Yang, Wu and Chen) have secondary forms of a faster pace. In literature preserved in its oldest schools, tai chi chuan is said to be a study of yin (receptive) and yang (active) principles, using terminology found in the Chinese classics, especially the Book of Changes (易經) and the Tao Te Ching( 道德經). Students are taught not to directly fight or resist an incoming force, but to meet it in softness and follow its motion while remaining in physical contact until the incoming force of attack exhausts itself or can be safely redirected, meeting yang with yin. 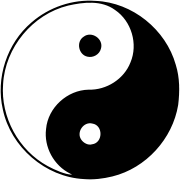 A primary goal of tai chi chuan training is to achieve this yin/yang or yang/yin balance in combat, and in a broader philosophical sense. The sensitivity needed to capture an opponent’s center of gravity is acquired over thousands of hours of yin (slow, repetitive, meditative, low impact) training followed by yang ("realistic," active, fast, high impact) martial training. Pushes and open hand strikes are more common than punches, and kicks are usually to the legs and lower torso, never higher than the hip depending on style. The fingers, fists, palms, sides of the hands, wrists, forearms, elbows, shoulders, back, hips, knees and feet are commonly used to strike. Joint traps, locks and breaks (chin na 擒拿) are also used. In the traditional schools, students are expected to show wu te (武德, martial virtue or heroism), to protect the defenseless and show mercy to opponents. Xingyiquan features aggressive shocking attacks and direct footwork. Its linear nature hints at both the military origins and the influence of spear technique alluded to in its mythology. Despite its hard, angular appearance, cultivating "soft" internal strength or qi is essential to achieving power in Xingyiquan. The goal of the xingyiquan exponent is to reach the opponent quickly and drive powerfully through them in a single burst. This is achieved by coordinating one's body as a single unit and the intense focusing of one's qi. Efficiency and economy of movement are the qualities of a xingyiquan stylist, and its fighting philosophy advocates simultaneous attack and defense. There are few kicks except for extremely low foot kicks and some mid-level kicks, and techniques are prized for their deadliness rather than aesthetic value. A practitioner of xingyiquan uses coordinated movements to generate bursts of power intended to overwhelm the opponent, simultaneously attacking and defending. Forms vary from school to school, but include barehanded sequences and versions of the same sequences with a variety of weapons. These sequences are based upon the movements and fighting behavior of a variety of animals. The training methods allow the student to progress through increasing difficulty in form sequences, timing, and fighting strategy. A long time is required to condition the body well enough to become adept at the internal style martial arts. Today, only a few traditional schools teaching internal styles train for combat. Most schools teach forms that are practiced primarily for their health benefits. Many health-oriented schools and teachers believe that the martial practices of neijia are no longer necessary in the modern world, and claim that students do not need to practice combat to benefit from the training. Traditionalists feel that a school not teaching martial aspects somewhere in their syllabus cannot be said to be actually teaching the art itself. Traditional teachers also believe that having both and understanding of the core theoretical principles of neijia and the ability to apply them is necessary in order to derive health benefits from its practice. Many teachers have not fully learned the martial aspects of their style, and some further dilute their training by supplementing their teaching with elements from other martial arts. Internal styles have been associated in legend and in much popular fiction with the Taoist monasteries of Wudangshan in central China. Neijia are a common theme in Chinese Wuxia novels and films, and are usually represented as originating in Wudang. Often, genuine internal practices are highly exaggerated to the point of making them seem miraculous, as in Crouching Tiger Hidden Dragon or Tai Chi Master. Internal concepts have also been a source of comedy in such films as Shaolin Soccer and Kung Fu Hustle. ↑ Meir Shahar, "Ming-Period Evidence of Shaolin Martial Practice," Harvard Journal of Asiatic Studies (December 2001) 61 (2): 359–413. ↑ Stanley Henning, Ignorance, Legend and Taijiquan. Journal of the Chenstyle Taijiquan. 2 (3): 1–7. Retrieved December 10, 2008. ↑ LonelyChina, Nejia. Retrieved December 10, 2008. ↑ 5.0 5.1 5.2 Y.L. Yip, "Pivot—Qi," The Journal of Traditional Eastern Health and Fitness (Autumn 2002) 12 (3). ↑ Douglas Wile, Lost T'ai-chi Classics from the Late Ch'ing Dynasty (Chinese Philosophy and Culture) (State University of New York Press, 1995, ISBN 978-0791426548). ↑ B.K. Francis, Power of Internal Martial Arts: Combat Secrets of Ba Gua, Tai Chi, and Hsing-I (North Atlantic Books, 1988). ↑ W.K. Kit, Art of Shaolin Kung Fu: The Secrets of Kung Fu for Self-Defense Health and Enlightenment (Tuttle, 2002). ↑ 9.0 9.1 Doug Woolidge, T’AI CHI, The International Magazine of T’ai Chi Ch’uan (June 1997) 21 (3). ↑ Zhang Lie, Classical Baguazhang Volume V: Yin Style Baguazhang, Trans. Joseph Crandall (Pinole, CA: Smiling Tiger Martial Arts, 1995). ↑ Shen Wu Martial Arts, Ba Gua Zhang, Tim Cartmell. Retrieved December 2, 2008. ↑ Douglas Wile, Taijiquan and Taoism from Religion to Martial Art and Martial Art to Religion, Journal of Asian Martial Arts 16 (4) ISSN 1057-8358. ↑ Robert W. Smith, Martial Musings (Via Media, 1999, ISBN 1-893765-00-8). Blofeld, J. Taoism, The Quest for Immortality. London: Mandala-Unwin Paperbacks, 1989. ISBN 0042990084. Chen, Kaiguo, Shunchao Zheng, and Thomas F. Cleary. Opening the Dragon Gate: The Making of a Modern Taoist Wizard. Boston: Charles E. Tuttle, 1996. ISBN 0804831858. Danaos, Kosta. Nei Kung, The Secret Teachings of the Warrior Sage. Inner traditions, 2002. ISBN 0892819073. Gongzao, Wu. Wu Family T'ai Chi Ch'uan (吳家太極拳). Hong Kong, 1980. ISBN 097804990X. Wile, Douglas. Lost T'ai-chi Classics from the late Ch'ing Dynasty. Albany, NY: State University of New York Press, 1996. ISBN 079142653X. Wile, Douglas. Lost T'ai-chi Classics from the Late Ch'ing Dynasty (Chinese Philosophy and Culture). State University of New York Press, 1995. ISBN 978-0791426548. Wong, Kiew Kit. The Art of Shaolin Kung Fu: The Secrets of Kung Fu for Self-Defense Health and Enlightenment. Tuttle martial arts. Boston, MA: Tuttle, 2002. ISBN 9780804834391. Yip, Li (Faye). "Principles and Practice of Sun Style T’ai Chi—T’AI CHI" The International Magazine of T’ai Chi Ch’uan. 22 (2). All links retrieved November 14, 2018. Internal vs. External, What Sets Them Apart? This page was last modified on 14 November 2018, at 16:32.